Digital printing on fabric paper has taken an exciting turn with Fusion Digital Paper’s Fusion Digital Satin Fabric. This coated one-side satin polyester fabric offers some very unique opportunities for those interested in creating custom personalized bookmarks, award ribbons, mattress labels and more. Once upon a time a cloth-like fabric paper that offered great runnability through high heat toner digital equipment while providing excellent image fidelity and toner adhesion seemed like a dream. Today, thanks to this revolutionary product, it is a reality. Fusion Digital Satin Fabric is an ultra-durable polyester fabric that makes digitally printing, and providing a better finished product for unique fabric applications easier. It also performs well during print finishing operations such as sewing, cutting and grommeting. It is highly resistant to shrinking or curling and is very resistant to degradation from rot, mildew and moisture. In short, this tear resistant, waterproof paper is great for outdoor applications. 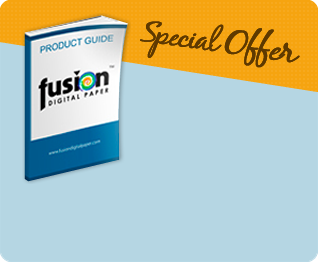 Fusion Digital Paper™ prides itself in creating versatile products. Our Fusion Digital Satin Fabric has proven perfect for a number of unique applications, and has made jobs that involve digital printing on fabric easier and more cost effective than ever. 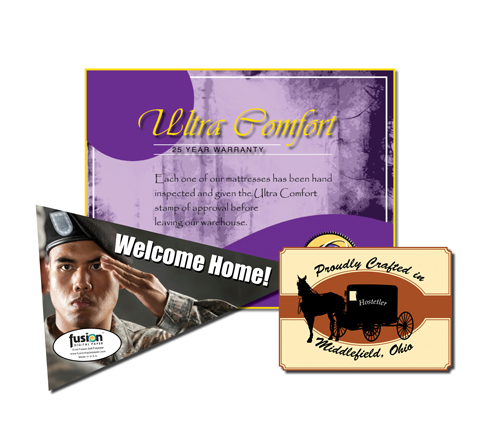 Applications that this unique product has been used for include private branding mattress labels for mattress manufacturing companies, personalized award ribbons, custom bookmarks, golf outing flags and custom event pennants. Fusion Digital Satin Fabric is also available in 12” x 47” banner size, which is perfect for creating waterproof and tear resistant indoor or outdoor banners on select digital equipment.